Construction for Phase 1 of the Noor Ouarzazate Solar Complex started in August 2013. Image: courtesy of Sener. Noor I will integrate Sener’s proprietary SENERtrough system. Image: courtesy of Sener. The Noor Ouarzazate Solar Complex will comprise four CSP plants. Image: courtesy of AfDB. The Noor Ouarzazate Solar Complex is being developed 10km north-east of the city of Ouarzazate. 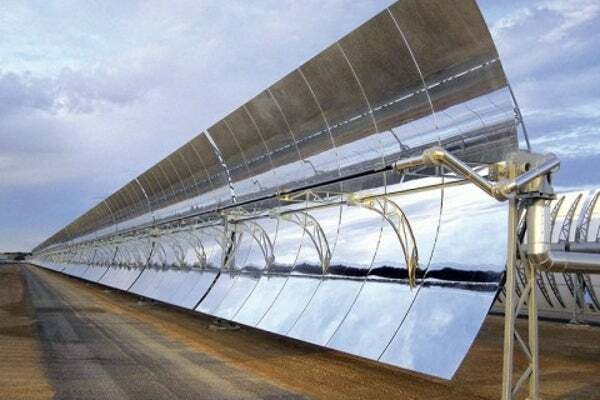 Phase one of the project involved the construction of a 160MW concentrated solar power (CSP) plant named Noor I, while phase two involves the construction of the 200MW Noor II CSP plant and the 150MW Noor III CSP plant, and Phase Three will involve the construction of the Noor IV CSP plant. The project is being developed on a build, own, operate and transfer (BOOT) basis by ACWA Power Ouarzazate, a consortium of ACWA Power, the Moroccan Agency for Solar Energy (Masen), Aries and TSK. The project forms part of the Moroccan Solar Energy Programme (NOOR), which aims to develop five solar complexes with a combined capacity of approximately 2GW by 2020 to meet the energy demands of the country, which depends on 95% imports. The Noor I CSP plant is expected to offset 240,000t a year of CO2 emissions, and generate approximately 1,000 construction jobs and 60 permanent jobs during the operations and maintenance phase. The Noor II and Noor III plants combined will help offset 533,000t of CO2 emissions a year. The technology licensor for the first three plants is Sener. Noor I is equipped with Sener’s proprietary SENERtrough cylindrical parabolic troughs, Noor II will integrate the SENERtrough-2 parabolic trough collectors and Noor III will use the central tower technology with salt receivers. Noor IV is proposed to be a photovoltaic solar plant. The Noor II and Noor III plants will have a molten salt storage capacity of seven hours each, whereas Noor I has a molten salt storage capacity of three hours. Noor I uses a wet cooling system whereas the latter plants will use a dry cooling system. The water required for the plants will be sourced from the Mansour Eddabhi dam, located approximately 12km from the project site, and stored in water storage reservoirs with a total capacity of 300,000m³. Noor II will cover an area of approximately 612ha and will be equipped with 400 loops, with each loop comprising of four connected solar collector assembly (SCA) modules, which will further incorporate 12 solar collector element (SCE) modules. Noor III will cover an area of approximately 598ha. The output from the complex will be conveyed to the Ouarzazate 225/60 KV station located near the complex. Masen has entered two separate power purchase agreements (PPAs) to off-take the entire output from Phases One and Two. "The Noor II and Noor III plants combined will help offset 533,000t of CO2 emissions a year." The financial closure for phase one was announced in June 2013, whereas phase two achieved financial closure in May 2015. The overall investment for Phase One is estimated to reach €500m ($537m approximately). It is being solely financed by the African Development Bank (AfDB) Group. The overall investment for Phase Two is estimated to reach $2bn, which is being funded through 80% debt and 20% equity. The debt facility is entirely being provided by Masen with funds secured from the AfDB, the Agence Française de Développement, the Clean Technology Fund, the European Commission, the European Investment Bank, Kreditanstalt für Wiederaufbau and the World Bank. The engineering, procurement and construction (EPC) contractor for phase one is the consortium of TSK Electrónica y Electicidad, Acciona Infrastructuras, Acciona Ingeniería, and Sener Ingeniería y Sistemas, whereas the EPC contractor for Phase Two is a consortium led by Sener and Sepco III. The technical advisory services for Phase Two were rendered by Lahmeyer International. The specific environmental and social impact assessment (SESIA) for Phase Two was prepared by 5 Capitals Environmental and Management Consulting (5 Capitals).